According to a recent study by Childwise, one in three children aged 9-16 are concerned about global events. War and terrorism were the two main areas of concern. This is a notable increase from 2015, when it was just one in four children. 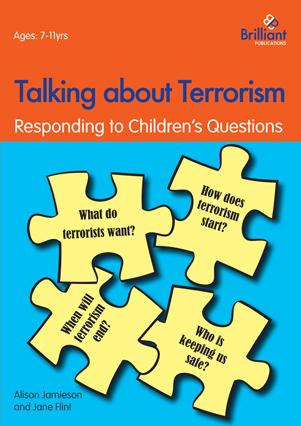 Brilliant Publications publishes two books to help teachers to respond to children’s questions about terrorism. Talking about Terrorism is for teachers of 7-11 year olds and Radicalisation and Terrorism is for teachers of 11-14 year olds. What do terrorists want? When will terrorism end? Children’s questions about terrorism can be penetrating and hard to answer. Many teachers (and parents) will be caught unawares by such questions, uncertain themselves about terrorist motivation and goals and torn between the instinct to reassure and the awareness that Britain is on continuous terrorist alert. How can we stop someone becoming a terrorist? Who is keeping us safe in Britain? Why are terrorists so angry and full of hate? The authors answer the questions in clear, easy-to-understand language – providing simple, objective explanations and reassurance where possible – while being careful not to raise unrealistic expectations. The text is interspersed with activities that primary school teachers can use to stimulate critical thinking and encourage creative investigation of key themes. These range from discussions and debates, the use of circle time and hot-seating through to role-play, poetry and music composition, singing and artwork. Despite the focus on terrorism the authors never lose sight of a core belief in human goodness. They make it a priority to focus on positive actions that children can perform, singly or collectively, to make the world more peaceful. Each section has inspiring stories of peacemaking and reconciliation, about the power of love over hate, of non-violence over violence and the importance of tolerance and respect. Written by Alison Jamieson, a former consultant to the United Nations Office on Drugs and Crime, and Jane Flint, a teacher, whose work in a multicultural school in Beeston, Leeds, at the time of the 2005 London bombings provided the inspiration for the book. Their book, Radicalisation and Terrorism: A Handbook for Addressing Extremism, was published by Brilliant Publications in 2015. 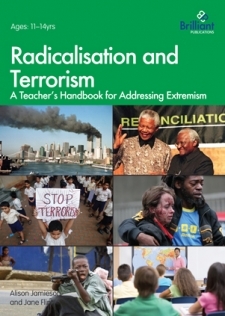 I’m delighted that Alison Jamieson, author of Radicalisation and Terrorism: A Teacher’s Handbook for Addressing Extremism, is quoted in the following article on the Parliamentary Inquiry into Extremism. The article calls Alison’s submission “arguably the most coherent written submission to the inquiry”. In her submission, Alison advocates the creation of “safe spaces” that might encourage classroom discussion of political violence, the terminology of terrorism, and peace-making through conflict resolution. The NSPCC have produced a really useful video on how to talk to children about terrorism. It shows that education and discussion are at least as important as prevention and detection. In the attached podcast, Sima Kotecha from the BBC talks to teachers and students and Elizabeth Garrett Anderson girls’ school in north London. The sentiments in the broadcast echo those of Alison Jamieson and Jane Flint in their book Radicalisation and Terrorism: A Teacher’s Handbook for Extremism. Both the podcast and the book show that schools can play an important role through providing opportunities for discussion and debate. ‘One can’t promise children that attacks will never happen again, but one can provide them with reliable and objective information. It is important for children to understand what terrorists want: they want governments to over react, they want publicity or attention; they want to change behaviour; they want to stir up hatred between different groups of people. Terrorists don’t want us to stand together and feel united. Most of all they want to keep violence and hatred going. A thought-provoking article considering the Prevent strategy but also how to moderate classroom discussions on terrorism has been published in the latest Teach Secondary magazine. This is such a powerful video. François Dufour, the Editor in Chief of Le Petit Quotidien, France’s only national newspaper for children, talks to a group of children about what they want to know and understand, following the atrocious events of last Friday.